The American Human: My War on Ann Romney! Actually, I don't have a war on Ann Romney. Just thought I'd title this piece using the mode o' the day. “It was tiny. And I didn’t have money to carpet the floor. But you can get remnants, samples, so I glued them together, all different colors. It looked awful, but it was carpeting. “We were happy, studying hard. Neither one of us had a job, because Mitt had enough of an investment from stock that we could sell off a little at a time. “The stock came from Mitt’s father. When he took over American Motors, the stock was worth nothing. But he invested Mitt’s birthday money year to year — it wasn’t much, a few thousand, but he put it into American Motors because he believed in himself. Five years later, stock that had been $6 a share was $96 and Mitt cashed it so we could live and pay for education. “Mitt and I walked to class together, shared housekeeping, had a lot of pasta and tuna fish and learned hard lessons." Not a stay-at-home mom, not in a "lovely neighborhood." Prevalence: Single motherhood is very common. Around half of today’s mothers will spend at least some time as the sole custodial parent. At any one time, almost one quarter of mothers are single mothers. Income: Half of single mother families have an annual income less than $25,000. Median income for single mother families is only one third the median for married couple families. Only one third of single mothers receive any child support, and the average amount these mothers receive is only about $300 a month. Poverty: Two fifths of single mother families are poor, triple the poverty rate for the rest of the population. The majority of poor children are in single mother families. Child poverty is linked to school dropout; to negative adult outcomes including joblessness and ill health; and to reduced economic output estimated to be about 4% of Gross Domestic Product. Hardship: Two fifths of single mother families are “food insecure,” one seventh use food pantries, one fifth have no health insurance, one third spend more than half their income on housing. Three quarters of homeless families are single mother families. Welfare & Food Stamp Receipt: Although two fifths of all single mothers are poor, only one tenth of all single mothers receive cash welfare assistance. Two fifths of all single mothers receive Food Stamps. 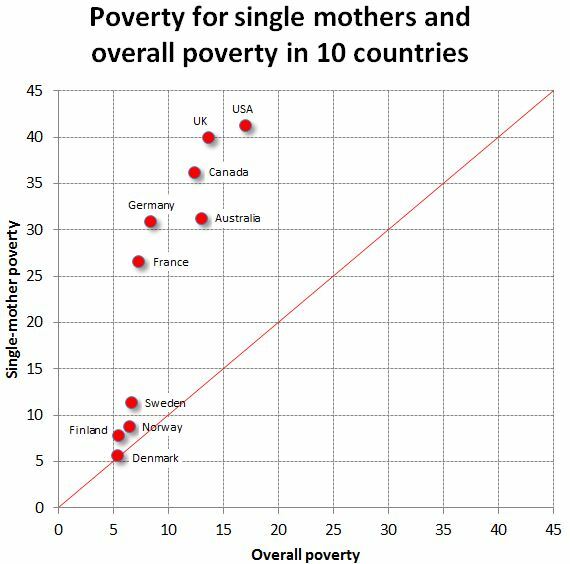 Compared to Single Mothers in Peer Countries: The single mother poverty rate in the U.S. is far above the average in high income countries even though the single mother employment rate in the U.S. is also above the average. Less generous income support programs in the U.S. help explain the exceptionally high poverty rate for single mother families in the U.S. 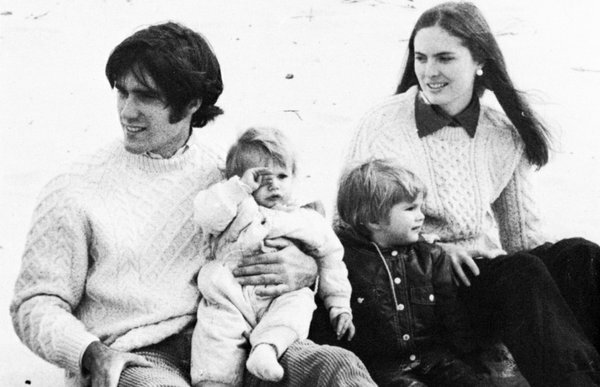 The young Romney family after the hard times when he had to sell some of his stock to get by. “Another son came along 18 months later, although we waited four years to have the third, because Mitt was still in school and we had no income except the stock we were chipping away at. We were living on the edge, not entertaining. No, I did not work. Mitt thought it was important for me to stay home with the children, and I was delighted. A single mother at a jobs fair. Currently, what's the fate of single mothers in our society? In 2010, the first full calendar year after the Great Recession, nearly 41 percent of the nation's single mothers with children under age 18, like Williams, lived on incomes below the federal poverty line. (Federal poverty measures differ according to family size.) New data released by the Census Bureau on Tuesday shows that few Americans fared well in 2010. About 46 million remained in or fell into poverty. The nation's median income dropped to levels unseen since the mid 1990s. But the percentage of single mothers with children under the age of 18 who are poor outstripped that of almost every other group. "We have a long history of distinguishing between the 'deserving poor' and the 'undeserving poor' in this country,” said Joan Entmacher, vice president for family economic security at the National Women's Law Center, a Washington, D.C.-based think tank and advocacy group. "For a lot of people, single mothers are so far outside their idea of the deserving poor that they can hardly think straight about what might be done to help these mothers or the millions of children that live with them." 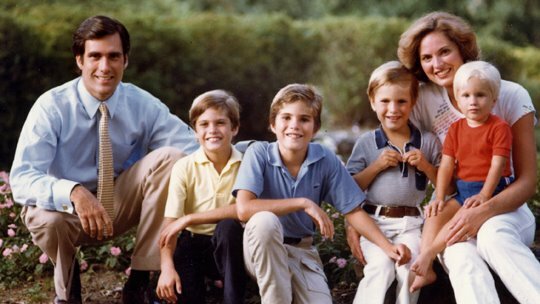 In the meantime, where did Ann Romney raise her boys? Here in Belmont, Massachusets during the Bain years. Here in La Jolla, CA (they're tearing this down to more than double it in size. Not here in Boston. Kids were grown. WASHINGTON -- For a woman with three houses and sixteen grandkids, Ann Romney doesn't have very much help around the house, according to her 2010 tax return. IRS forms released Tuesday by Mitt Romney's presidential campaign show that despite reporting income of $21.7 million, the couple paid only $20,603 in taxable wages for household help in 2010. This figure was divided among four women: Rosania Costa ($4,808), Kelli Harrison ($8,667), Susan Moore ($2,238) and Valerie Cravens Anae ($4,890). According to a number of Boston-based domestic staffing agencies, the salary range for a housekeeper is between $20 and $30 an hour, which adds up to an annual salary of $40,000 to $50,000 based on forty-hour weeks and two weeks of paid vacation a year. But this number is only for one house, and the Romneys have three houses -- a 2,000 sq. ft. townhouse in Belmont, Mass., a 5,400 sq. ft. lake house on 11 acres in Wolfeboro, N.H., and a beach house in La Jolla, Calif., that is undergoing renovations to double its size. Even if the Romneys avoided spending time in La Jolla in 2010, they spent plenty of time in New Hampshire, with regular visits in the summer from five sons and their families. Yet the Romneys still paid only half of the lowest range of an average housekeeper's salary, which raises the question of who cleaned the Romney houses the other 50 percent of the time. A Romney campaign adviser declined to respond to questions from The Huffington Post about the housekeeping salaries. Here's a link to a story about a nanny/maid, Juanita, that took care of young Ann. Apparently, she had a privileged upbringing. This is getting a little funny. We can stop worrying about them now. what's wrong with getting married and going to college?